This blog is part of our free SQL Server tutorial. DDL, or Data Definition Language triggers are executed when objects in your database are changed in some way. The main SQL keywords to which a DDL trigger can be attached are CREATE, ALTER and DROP. There are several other keywords that can fire a DDL trigger, including GRANT, DENY, REVOKE and UPDATE STATISTICS. It's also worth noting that some system stored procedures can cause a DDL trigger to fire. DDL triggers always run after the event to which they are attached. There's no equivalent of the INSTEAD OF type of DML trigger. There is a long list of DDL events at the Microsoft Developer Network site. If you want to find out which events have caused your DDL triggers to fire you can use the EVENTDATA function. 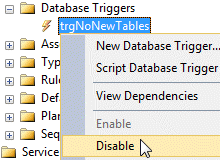 Triggers scoped to a database will be found in the Database Triggers folder within the Programmability folder of the database. 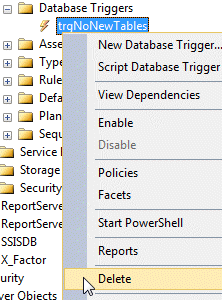 Server-scoped triggers are stored in the Triggers folder within the Server Objects folder of the server. Once you've chosen the option shown above you'll be presented with a page of system-generated code which you'll then have to adapt to create your trigger. A sample of the system-generated code for creating a DDL trigger. 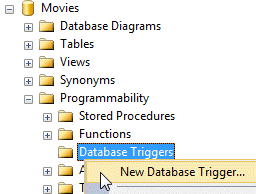 Triggers that are scoped to the database appear in the Database Triggers folder within the database. 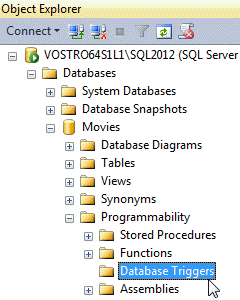 Expand the Programmability folder in the database to find the Database Triggers folder. 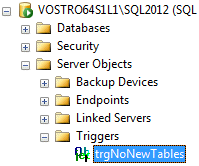 This is the error message shown when a new table is created. You'll find this type of trigger in the Triggers folder of the server. Expand the Server Objects folder within the server to find the Triggers folder. Right-click on the trigger and choose to Delete it. This works for triggers scoped to the database and to the server. Right-click the trigger and choose this option to disable it. Right-click the trigger and choose this option to enable it. The first three parameters are the same as for DML triggers. The fourth parameter, @namespace, refers to the scope of the trigger and can be either 'DATABASE' or 'SERVER'. You can have both a server-scoped and database-scoped trigger handling the same DDL event. 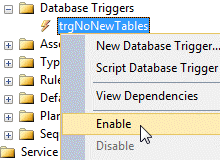 Server-scoped triggers will always fire before any of the database-scoped ones. 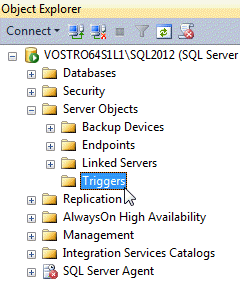 The next part of this series covers the final type of trigger in SQL Server; the Logon trigger.